Screen patients for acute kidney injury and other conditions that may reduce renal function. For patients at risk for chronically reduced renal function (e.g. age > 60 years, hypertension, diabetes), estimate the glomerular filtration rate (GFR) through laboratory testing (5.1). For patients at highest risk for NSF, do not exceed the recommended DOTAREM dose and allow a sufficient period of time for elimination of the drug from the body prior to any re-administration [see Warnings and Precautions (5.1)]. These highlights do not include all the information needed to use DOTAREM safely and effectively. See full prescribing information for DOTAREM. Screen patients for acute kidney injury and other conditions that may reduce renal function. For patients at risk for chronically reduced renal function (for example age > 60 years, hypertension or diabetes), estimate the glomerular filtration rate (GFR) through laboratory testing (5.1). To report SUSPECTED ADVERSE REACTIONS, contact GUERBET LLC at 1-877-729-6679 or FDA at 1-800-FDA-1088 or www.fda.gov/medwatch. 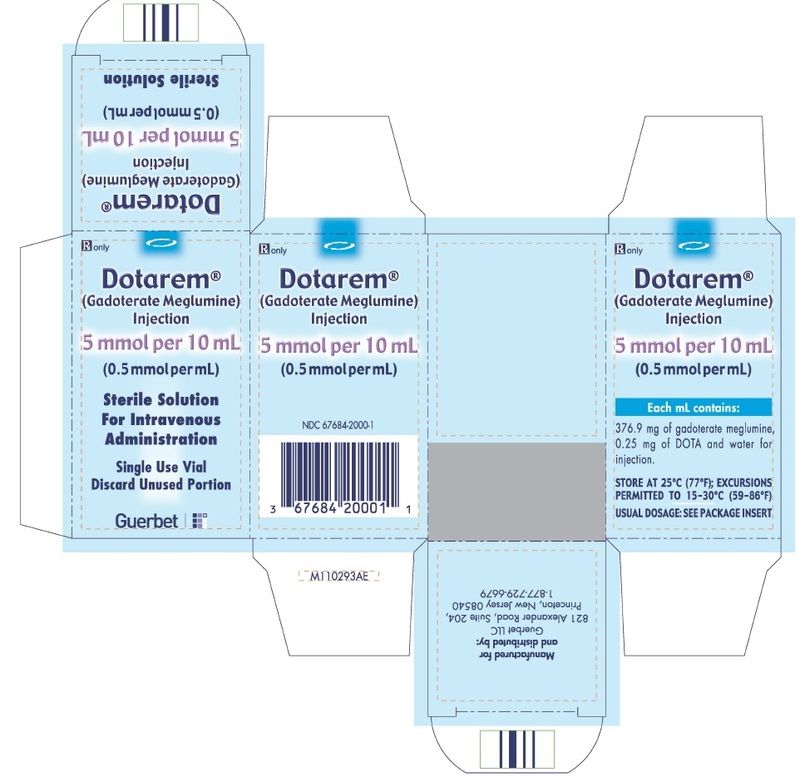 DOTAREM is a gadolinium-based contrast agent indicated for intravenous use with magnetic resonance imaging (MRI) in brain (intracranial), spine and associated tissues in adult and pediatric patients (including term neonates) to detect and visualize areas with disruption of the blood brain barrier (BBB) and/or abnormal vascularity. For adult and pediatric patients (including term neonates), the recommended dose of DOTAREM is 0.2 mL/kg (0.1 mmol/kg) body weight administered as an intravenous bolus injection, manually or by power injector, at a flow rate of approximately 2 mL/second for adults and 1 - 2 mL/second for pediatric patients. Table 1 provides weight-adjusted dose volumes. To ensure complete injection of DOTAREM the injection may be followed by normal saline flush. Contrast MRI can begin immediately following DOTAREM injection. Visually inspect DOTAREM for particulate matter prior to administration. Do not use the solution if particulate matter is present or if the container appears damaged. DOTAREM should be a clear, colorless to yellow solution. Do not mix with other drugs or parenteral nutrition. Discard any unused portions of the drug. Aseptically draw up the contrast medium into a disposable syringe and use immediately. 1) Screw the threaded tip of the plunger rod clockwise into the cartridge plunger and push forward a few millimeters to break any friction between the cartridge plunger and syringe barrel. 2) Holding the syringe vertically so the rubber cap is pointed upward, aseptically remove the rubber cap from the tip of the syringe and attach either a sterile, disposable needle or compatible needleless luer lock tubing set using a push-twist action. At this point, the tubing set is not attached to a patient’s intravenous connection. If using a needleless luer lock tubing set, check the connection between the syringe and the tubing as the fluid flows. Ensure that the connection is successful before administration of DOTAREM Injection. If using a needle, hold the syringe vertically and push plunger forward until all of the air is evacuated and fluid either appears at the tip of the needle or the tubing is filled. Following the usual venous blood aspiration procedure, complete the DOTAREM injection. 3) To ensure complete delivery of the contrast medium, the injection may be followed by a normal saline flush. 4) Properly dispose of the syringe and any other materials used. 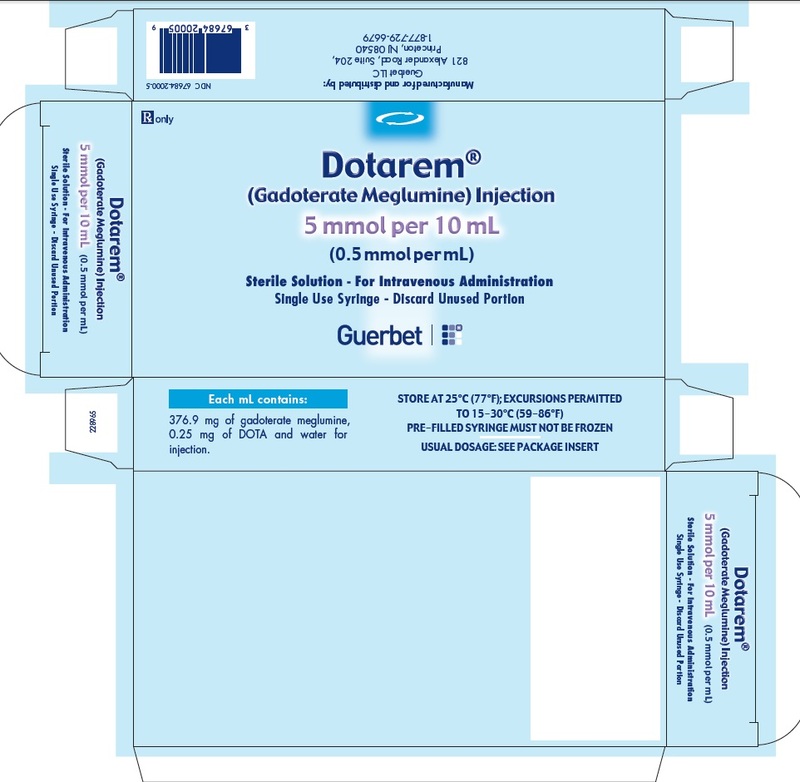 DOTAREM 0.5 mmol/mL is a sterile, clear, colorless to yellow, aqueous solution for intravenous injection containing 376.9 mg/mL gadoterate meglumine and is available in vials and pre-filled syringes. History of clinically important hypersensitivity reactions to DOTAREM [see Warnings and Precautions (5.2)]. Gadolinium-based contrast agents (GBCAs) increase the risk for nephrogenic systemic fibrosis (NSF) among patients with impaired elimination of the drugs. Avoid use of GBCAs among these patients unless the diagnostic information is essential and not available with non-contrast MRI or other modalities. The GBCA-associated NSF risk appears highest for patients with chronic, severe kidney disease (GFR < 30 mL/min/1.73 m2) as well as patients with acute kidney injury. The risk appears lower for patients with chronic, moderate kidney disease (GFR 30 - 59 mL/min/1.73 m2) and little, if any, for patients with chronic, mild kidney disease (GFR 60 - 89 mL/min/1.73 m2). NSF may result in fatal or debilitating fibrosis affecting the skin, muscle and internal organs. Report any diagnosis of NSF following DOTAREM administration to Guerbet LLC (1-877-729-6679) or FDA (1-800-FDA-1088 or www.fda.gov/medwatch). The factors that may increase the risk for NSF are repeated or higher than recommended doses of a GBCA and the degree of renal impairment at the time of exposure. Record the specific GBCA and the dose administered to a patient. For patients at highest risk for NSF, do not exceed the recommended DOTAREM dose and allow a sufficient period of time for elimination of the drug prior to re-administration. For patients receiving hemodialysis, physicians may consider the prompt initiation of hemodialysis following the administration of a GBCA in order to enhance the contrast agent’s elimination. The usefulness of hemodialysis in the prevention of NSF is unknown [see Dosage and Administration (2) and Clinical Pharmacology (12)]. Anaphylactic and anaphylactoid reactions have been reported with DOTAREM, involving cardiovascular, respiratory, and/or cutaneous manifestations. Some patients experienced circulatory collapse and died. In most cases, initial symptoms occurred within minutes of DOTAREM administration and resolved with prompt emergency treatment [see Adverse Reactions (6)]. During and following DOTAREM administration, observe patients for signs and symptoms of hypersensitivity reactions. Gadolinium is retained for months or years in several organs. The highest concentrations (nanomoles per gram of tissue) have been identified in the bone, followed by other organs (e.g. brain, skin, kidney, liver and spleen). The duration of retention also varies by tissue and is longest in bone. Linear GBCAs cause more retention than macrocyclic GBCAs. At equivalent doses, gadolinium retention varies among the linear agents with Omniscan (gadodiamide) and Optimark (gadoversetamide) causing greater retention than other linear agents [Eovist (gadoxetate disodium), Magnevist (gadopentetate dimeglumine), MultiHance (gadobenate dimeglumine)]. Retention is lowest and similar among the macrocyclic GBCAs [Dotarem (gadoterate meglumine), Gadavist (gadobutrol), ProHance (gadoteridol)]. In patients with chronically reduced renal function, acute kidney injury requiring dialysis has occurred with the use of GBCAs. The risk of acute kidney injury may increase with increasing dose of the contrast agent; administer the lowest dose necessary for adequate imaging. Screen all patients for renal impairment by obtaining a history and/or laboratory tests. Consider follow-up renal function assessments for patients with a history of renal dysfunction. Ensure catheter and venous patency before the injection of DOTAREM. Extravasation into tissues during DOTAREM administration may result in tissue irritation [see Nonclinical Toxicology (13.2)]. GBCAs have been associated with a risk for NSF [see Warnings and Precautions (5.1)]. Confirmed diagnosis of NSF has not been reported in patients with a clear history of exposure to DOTAREM alone. Hypersensitivity reactions and acute kidney injury are described in other sections of the labeling [see Warnings and Precautions (5.2) and (5.3)]. The data described below reflect DOTAREM exposure in 2867 patients, representing 2682 adults and 185 pediatric patients. Overall, 55% of the patients were men. In clinical trials where ethnicity was recorded the ethnic distribution was 81% Caucasian, 11% Asian, 4% Black, and 4% others. The average age was 53 years (range from < 1 week to 97 years). Overall, 4% of patients reported at least one adverse reaction, primarily occurring immediately or within 24 hours following DOTAREM administration. Most adverse reactions were mild or moderate in severity and transient in nature. Table 2 lists adverse reactions that occurred in ≥ 0.2% patients who received DOTAREM. Adverse reactions that occurred with a frequency < 0.2% in patients who received DOTAREM include: feeling cold, feeling hot, burning sensation, somnolence, pain, dizziness, dysgeusia, blood creatinine increased, hypotension, hypertension, asthenia, fatigue, injection site reactions (inflammation, extravasation, pruritus, swelling, warmth), paresthesia, pruritus, laryngeal discomfort, pain in extremity, vomiting, anxiety and palpitations. During clinical trials, 185 pediatric patients (52 aged < 24 months, 33 aged 2 - 5 years, 57 aged 6 - 11 years and 43 aged 12 - 17 years) received DOTAREM. Overall, 7 pediatric patients (3.8%) reported at least one adverse reaction following DOTAREM administration. The most frequently reported adverse reaction was headache (1.1%). Most adverse events were mild in severity and transient in nature. The following additional adverse reactions have been identified during postmarketing use of DOTAREM. Because these reactions are reported voluntarily from a population of uncertain size, it is not always possible to reliably estimate their frequency or establish a causal relationship to drug exposure. NSF, in patients whose reports were confounded by the receipt of other GBCAs or in situations where receipt of other GBCAs could not be ruled out. No unconfounded cases of NSF have been reported with DOTAREM. Gadoterate does not interfere with serum and plasma calcium measurements determined by colorimetric assays. Specific drug interaction studies with DOTAREM have not been conducted. GBCAs cross the human placenta and result in fetal exposure and gadolinium retention. The human data on the association between GBCAs and adverse fetal outcomes are limited and inconclusive (see Data). In animal reproduction studies, there were no adverse developmental effects observed in rats or rabbits with intravenous administration of gadoterate meglumine during organogenesis at doses up to 16 and 10 times, respectively, the recommended human dose (see Data). Because of the potential risks of gadolinium to the fetus, use DOTAREM only if imaging is essential during pregnancy and cannot be delayed. The estimated background risk of major birth defects and miscarriage for the indicated population(s) are unknown. All pregnancies have a background risk of birth defect, loss, or other adverse outcomes. In the U.S. general population, the estimated background risk of major birth defects and miscarriage in clinically recognized pregnancies is 2-4% and 15-20% respectively. Cohort studies and case reports on exposure to GBCAs during pregnancy have not reported a clear association between GBCAs and adverse effects in the exposed neonates. However, a retrospective cohort study, comparing pregnant women who had a GBCA MRI to pregnant women who did not have an MRI, reported a higher occurrence of stillbirths and neonatal deaths in the group receiving GBCA MRI. Limitations of this study include a lack of comparison with non-contrast MRI and lack of information about the material indication for MRI. Overall, these data preclude a reliable evaluation of the potential risk of adverse fetal outcomes with the use of GBCAs in pregnancy. Gadoterate meglumine was administered in intravenous doses of 0, 2, 4 and 10 mmol/kg/day [3, 7 and 16 times the recommended human dose (RHD) based on body surface area (BSA)) to female rats for 14 days before mating, throughout the mating period and until gestation day (GD) 17. Pregnant rabbits were administered gadoterate meglumine in intravenous doses levels of 0, 1, 3 and 7 mmol/kg/day ( 3, 10 and 23 times the RHD based on BSA) from GD6 to GD19. No effects on embryo-fetal development were observed at doses up to 10 mmol/kg/day in rats or 3 mmol/kg/day in rabbits. Maternal toxicity was observed in rats at 10 mmol/kg/day and in rabbits at 7 mmol/kg/day. This maternal toxicity was characterized in rats by a slightly lower litter size and gravid uterus weight compared to the control group, and in rabbits by a reduction in body weight and food consumption. There are no data on the presence of gadoterate in human milk, the effects on the breastfed infant, or the effects on milk production. However, published lactation data on other GBCAs indicate that 0.01 to 0.04% of the maternal gadolinium dose is present in breast milk. Additionally, there is limited GBCA gastrointestinal absorption in the breast-fed infant. Gadoterate is present in goat milk (see Data). The developmental and health benefits of breastfeeding should be considered along with the mother’s clnical need for DOTAREM and any potential adverse effects on the breastfed infant from DOTAREM or from the underlying maternal condition. Nonclinical data demonstrate that gadoterate is detected in goat milk in amounts < 0.1% of the dose intravenously administered. Furthermore, in rats, absorption of gadoterate via the gastrointestinal tract is poor (1.2% of the administered dose was absorbed and eliminated in urine). The safety and efficacy of DOTAREM at a single dose of 0.1 mmol/kg have been established in pediatric patients from birth (term neonates ≥ 37 weeks gestational age) to 17 years of age based on clinical data in 133 pediatric patients 2 years of age and older, and clinical data in 52 pediatric patients birth to less than 2 years of age that supported extrapolation from adult data [see Clinical Studies (14)]. Adverse reactions in pediatric patients were similar to those reported in adults [see Adverse Reactions (6.1)]. No dosage adjustment according to age is necessary in pediatric patients [See Dosage and Administration (2.1), Pharmacokinetics (12.3)]. The safety of DOTAREM has not been established in preterm neonates. No cases of NSF associated with DOTAREM or any other GBCA have been identified in pediatric patients age 6 years and younger [see Warnings and Precautions (5.1)]. Normal estimated GFR (eGFR) is approximately 30 mL/minute/1.73m2 at birth and increases to adult values by 2 years of age. In clinical studies of DOTAREM, 900 patients were 65 years of age and over, and 304 patients were 75 years of age and over. No overall differences in safety or efficacy were observed between these subjects and younger subjects. In general, use of DOTAREM in elderly patients should be cautious, reflecting the greater frequency of impaired renal function and concomitant disease or other drug therapy. No age-related dosage adjustment is necessary. No DOTAREM dosage adjustment is recommended for patients with renal impairment. Gadoterate can be removed from the body by hemodialysis [see Warnings and Precautions (5.1) and Clinical Pharmacology (12.3)]. DOTAREM administered to healthy volunteers and to patients at cumulative doses up to 0.3 mmol/kg was tolerated in a manner similar to lower doses. Adverse reactions to overdosage with DOTAREM have not been reported. Gadoterate meglumine can be removed from the body by hemodialysis [See Clinical Pharmacology (12.3)]. DOTAREM (gadoterate meglumine) is a paramagnetic macrocyclic ionic contrast agent administered for magnetic resonance imaging. The chemical name for gadoterate meglumine is D-glucitol, 1-deoxy-1-(methylamino)-,[1,4,7,10-tetraazacyclododecane-1,4,7,10-tetraaceto(4-)-.kappa.N1, .kappa.N4, .kappa.N7, .kappa.N10, .kappa.O1, .kappa.O4, .kappa.O7, .kappa.O10]gadolinate(1-)(1:1); it has a formula weight of 753.9 g/mol and empirical formula of C23H42O13N5Gd (anhydrous basis). DOTAREM Injection is a sterile, nonpyrogenic, clear, colorless to yellow, aqueous solution of 0.5 mmol/mL of gadoterate meglumine. No preservative is added. 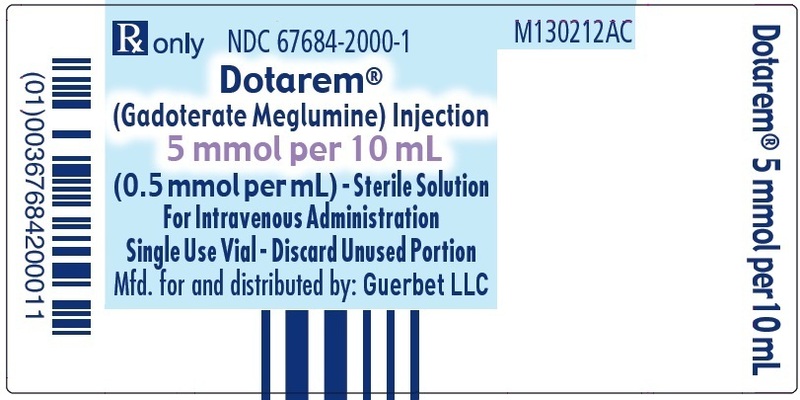 Each mL of DOTAREM contains 376.9 mg of gadoterate meglumine, 0.25 mg of DOTA and water for injection. DOTAREM has a pH of 6.5 to 8.0. The thermodynamic stability constants for gadoterate (log Ktherm and log Kcond at pH 7.4) are 25.6 and 19.3, respectively. Gadoterate is a paramagnetic molecule that develops a magnetic moment when placed in a magnetic field. The magnetic moment enhances the relaxation rates of water protons in its vicinity, leading to an increase in signal intensity (brightness) of tissues. When placed in a magnetic field, gadoterate shortens the T1 and T2 relaxation times in target tissues. At recommended doses, the effect is observed with greatest sensitivity in the T1-weighted sequences. Gadoterate affects proton relaxation times and consequently the MR signal, and the contrast obtained is characterized by the relaxivity of the gadoterate molecule. The relaxivity values for gadoterate are similar across the spectrum of magnetic field strengths used in clinical MRI (0.2 - 1.5 T). Disruption of the blood-brain barrier or abnormal vascularity allows distribution of gadoterate in lesions such as neoplasms, abscesses, and infarcts. The pharmacokinetics of total gadolinium assessed up to 48 hours following an intravenously administered 0.1 mmol/kg dose of DOTAREM in healthy adult subjects demonstrated a mean elimination half-life (reported as mean ± SD) of about 1.4 ± 0.2 hr and 2.0 ± 0.7 hr in female and male subjects, respectively. Similar pharmacokinetic profile and elimination half-life values were observed after intravenous injection of 0.1 mmol/kg of DOTAREM followed 20 minutes later by a second injection of 0.2 mmol/kg (1.7 ± 0.3 hr and 1.9 ± 0.2 hr in female and male subjects, respectively). The volume of distribution at steady state of total gadolinium in normal subjects is 179 ± 26 and 211 ± 35 mL/kg in female and male subjects respectively, roughly equivalent to that of extracellular water. Gadoterate does not undergo protein binding in vitro. The extent of blood cell partitioning of gadoterate is not known. Following GBCA administration, gadolinium is present for months or years in brain, bone, skin and other organs [see Warnings and Precautions (5.3)]. Gadoterate is not known to be metabolized. Following a 0.1 mmol/kg dose of DOTAREM, total gadolinium is excreted primarily in the urine with 72.9 ± 17.0 % and 85.4 ± 9.7 % (mean ± SD) eliminated within 48 hours, in female and male subjects, respectively. Similar values were achieved after a cumulative dose of 0.3 mmol/kg (0.1 + 0.2 mmol/kg, 20 minutes later), with 85.5 ± 13.2 % and 92.0 ± 12.0 % recovered in urine within 48 hrs in female and male subjects respectively. In healthy subjects, the renal and total clearance rates of total gadolinium are comparable (1.27 ± 0.32 and 1.74 ± 0.12 mL/min/kg in females; and 1.40 ± 0.31 and 1.64 ± 0.35 mL/min/kg in males, respectively) indicating that the drug is primarily cleared through the kidneys. Within the studied dose range (0.1 to 0.3 mmol/kg), the kinetics of total gadolinium appear to be linear. A single intravenous dose of 0.1 mmol/kg of DOTAREM was administered to 8 patients (5 men and 3 women) with impaired renal function (mean serum creatinine of 498 ± 98 µmol/L in the 10 - 30 mL/min creatinine clearance group and 192 ± 62 µmol/L in the 30 - 60 mL/min creatinine clearance group). Renal impairment delayed the elimination of total gadolinium. Total clearance decreased as a function of the degree of renal impairment. The distribution volume was unaffected by the severity of renal impairment (Table 5). No changes in renal function test parameters were observed after DOTAREM injection. The mean cumulative urinary excretion of total gadolinium was approximately 76.9 ± 4.5% in 48 hrs in patients with moderate renal impairment, 68.4 ± 3.5% in 72 hrs in patients with severe renal impairment and 93.3 ± 4.7% in 24 hrs for subjects with normal renal function. Gadoterate was shown to be dialyzable after an IV injection of DOTAREM in 10 patients with end-stage renal failure who required hemodialysis treatment. Gd serum concentration decreased over time by 88%, 93% and 97% at 0.5 hr, 1.5 hr, and 4 hrs after start of dialysis, respectively. A second and third hemodialysis session further removed Gd. After the third dialysis, Gd serum concentration decreased by 99.7%. The pharmacokinetics of gadoterate in pediatric patients receiving DOTAREM aged birth (term neonates) to 23 months, was investigated in an open label, multicenter study, using a population pharmacokinetics approach. A total of 45 subjects (22 males, 23 females) received a single intravenous dose of DOTAREM 0.1 mmol/kg (0.2 mL/kg). The age ranged from less than one week to 23.8 months (mean 9.9 months) and body weight ranged from 3 to 15 kg (mean 8.1 kg). Individual level of renal maturity in the study population, as expressed by eGFR ranged between 52 and 281 mL/min/1.73 m2 and 11 patients had an eGFR below 100 mL/min/1.73 m2 (range 52 to 95 mL/min/1.73 m2). Gadoterate concentrations obtained up to 8 hours after DOTAREM administration were best fitted using a biphasic model with linear elimination from the intravascular space. The mean clearance adjusted to body weight was estimated at 0.16 ± 0.07 L/h/kg and increased with eGFR. The estimated mean elimination half-life was 1.47 ± 0.45 hr. The body weight adjusted clearance of gadoterate after single intravenous injection of 0.1 mmol/kg of DOTAREM in pediatric subjects aged less than 2 years was similar to that observed in healthy adults. Long-term animal studies have not been performed to evaluate the carcinogenic potential of gadoterate meglumine. Gadoterate meglumine did not demonstrate mutagenic potential in in vitro bacterial reverse mutation assays (Ames test) using Salmonella typhimurium, in an in vitro chromosome aberration assay in Chinese hamster ovary cells, in an in vitro gene mutation assay in Chinese hamster lung cells, nor in an in vivo mouse micronucleus assay. No impairment of male or female fertility and reproductive performance was observed in rats after intravenous administration of gadoterate meglumine at the maximum tested dose of 10 mmol/kg/day (16 times the maximum human dose based on surface area), given during more than 9 weeks in males and more than 4 weeks in females. Sperm counts and sperm motility were not adversely affected by treatment with the drug. Local intolerance reactions, including moderate irritation associated with infiltration of inflammatory cells were observed after perivenous injection in rabbits suggesting the possibility of local irritation if the contrast medium leaks around the veins in a clinical setting [see Warnings and Precautions (5.4)]. Toxicity of gadoterate meglumine was evaluated in neonatal and juvenile (pre- and post-weaning) rats following a single or repeated intravenous administration at doses 1, 2, and 4 times the MHD based on BSA. Gadoterate meglumine was well tolerated at all dose levels tested and had no effect on growth, pre-weaning development, behavior and sexual maturation. Efficacy and safety of DOTAREM were evaluated in a multi-center clinical trial (Study A) that enrolled 364 adult and 38 pediatric patients (aged ≥ 2 years) with known or suspected CNS lesions. Adults were randomized 2 to 1 to receive either DOTAREM or gadopentetate dimeglumine, each administered at a dose of 0.1 mmol/kg. All pediatric patients received DOTAREM, also at a dose of 0.1 mmol/kg. In the trial, patients first underwent a baseline (pre-contrast) MRI examination followed by the assigned GBCA administration and a post-contrast MR examination. The images (pre-contrast, post-contrast and “paired pre- and post-contrast”) were interpreted by three independent off-site readers blinded to clinical information. The primary efficacy analysis compared three patient-level visualization scores (paired images) to baseline MRI (pre-contrast images) for adults who received DOTAREM. The three primary visualization components were: contrast enhancement, border delineation and internal morphology. For each of these components there was a pre-defined scoring scale. Lesion counting (up to five per patient) was also reflected within each component’s patient-level visualization score. Among the adult patients, 245 received DOTAREM and their data comprised the primary efficacy population. There were 114 (47%) men and 131 (53%) women with a mean age of 53 years (range 18 to 85 years), the racial and ethnic representations were 84% Caucasian, 11% Asian, 4% Black, and 1% other. Table 6 displays a comparison of paired images (pre-and post-contrast) to pre-contrast images with respect to the proportion of patients who had paired image scores that were greater “better”, or same/worse “not better” than the pre-contrast scores and with respect to the difference in the mean patient level visualization score. Across the three readers 56% to 94% of patients had improved lesion visualization for paired images compared to pre-contrast images. DOTAREM provided a statistically significant improvement for all three primary visualization components. More lesions were seen on the paired images than the pre-contrast images. In secondary analyses, post-contrast images were improved in comparison to pre-contrast images. DOTAREM lesion visualization scores were similar to those for gadopentetate dimeglumine. DOTAREM imaging results in the pediatric patients were also similar to those seen in adults. In a second clinical trial (Study B), MR images were reread from 150 adult patients with known CNS lesions who had participated in previously conducted clinical trial. DOTAREM administration and image interpretation was performed in the same manner as in Study A. Similar to Study A, this trial also demonstrated improved lesion visualization with DOTAREM. A non-randomized study (Study C) with 28 pediatric patients under 2 years of age who were referred for contrast MRI of the CNS supported extrapolation of CNS efficacy findings from adults and older children. CNS lesions were identified in 16 of these 28 patients on paired pre- and post-contrast images compared to 15 patients on pre-contrast images alone. In the 16 patients who had identifiable lesions, the scores for the co-endpoints of lesion visualization were improved for at least one lesion on paired pre- and post-contrast images compared to pre-contrast images in 8 out of 16 (50%) patients for lesion border delineation, 8 out of 16 (50%) patients for lesion internal morphology, and 14 out of 16 (88%) patients for lesion contrast enhancement. 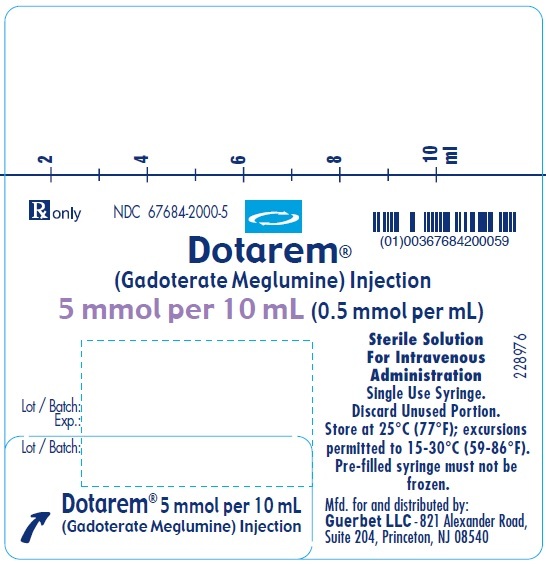 DOTAREM Injection is a clear, colorless to yellow solution containing 0.5 mmol/mL of gadoterate meglumine. It is supplied in vials and prefilled syringes. DOTAREM Injection is supplied in 10 mL vials containing 5 mL or 10 mL of solution, in 20 mL vials containing 15 mL or 20 mL of solution. DOTAREM Injection is supplied in 10 mL pre-filled syringes containing 10 mL of solution and 20 mL pre-filled syringes containing 15 mL or 20 mL of solution. Store at 25°C (77°F); excursions permitted to 15°C to 30°C (59°F to 86°F) [see USP, Controlled Room Temperature (CRT)]. Pre-filled syringes must not be frozen. Frozen syringes should be discarded. Should solidification occur in the vial because of exposure to the cold, bring DOTAREM to room temperature before use. If allowed to stand at room temperature for a minimum of 90 minutes, DOTAREM should return to a clear, colorless to yellow solution. Before use, examine the product to assure that all solids are dissolved and that the container and closure have not been damaged. Discard the vial if solids persist. Describe the clinical manifestations of NSF. Instruct the patients to contact their physician if they develop signs or symptoms of NSF following DOTAREM administration, such as burning, itching, swelling, scaling, hardening and tightening of the skin; red or dark patches on the skin; stiffness in joints with trouble moving, bending or straightening the arms, hands, legs or feet; pain in the hip bones or ribs; or muscle weakness. Reactions along the venous injection site, such as mild and transient burning or pain or feeling of warmth or coldness at the injection site. Side effects of headache, nausea, abnormal taste and feeling hot. Gadolinium Retention: Advise patients that gadolinium is retained for months or years in brain, bone, skin, and other organs in patients with normal renal function. The clinical consequences of retention are unknown. Retention depends on multiple factors and is greater following administration of linear GBCAs than following administration of macrocyclic GBCAs [see Warnings and Precautions (5.3)]. DOTAREM is a prescription medicine called a gadolinium-based contrast agent (GBCA). DOTAREM, like other GBCAs, is injected into your vein and used with a magnetic resonance imaging (MRI) scanner. An MRI exam with a GBCA, including DOTAREM, helps your doctor to see problems better than an MRI exam without a GBCA. What is the most important information I should know about DOTAREM? DOTAREM contains a metal called gadolinium. Small amounts of gadolinium can stay in your body including the brain, bones, skin and other parts of your body for a long time (several months to years). Rarely patients have reported pains, tiredness, and skin, muscle or bone ailments for a long time, but these symptoms have not been directly linked to gadolinium. There are different GBCAs that can be used for your MRI exam. The amount of gadolinium that stays in the body is different for different gadolinium medicines. Gadolinium stays in the body more after Omniscan or Optimark than after Eovist, Magnevist or MultiHance. Gadolinium stays in the body the least after Dotarem, Gadavist or ProHance. Some people with kidney problems who get gadolinium medicines can develop a condition with severe thickening of the skin, muscles and other organs in the body (nephrogenic systemic fibrosis). Your healthcare provider should screen you to see how well your kidneys are working before you receive DOTAREM. Do not receive DOTAREM if you have had a severe allergic reaction to DOTAREM. are pregnant or plan to become pregnant. It is not known if DOTAREM can harm your unborn baby. Talk to your healthcare provider about the possible risks to an unborn baby if a GBCA such as DOTAREM is received during pregnancy. What are possible side effects of DOTAREM? See What is the most important information I should know about DOTAREM? Allergic reactions. DOTAREM can cause allergic reactions that can sometimes be serious. Your healthcare provider will monitor you closely for symptoms of an allergic reaction. The most common side effects of DOTAREM include: nausea, headache, pain, or cold feeling at the injection site, and rash. These are not all the possible side effects of DOTAREM. General information about the safe and effective uses of DOTAREM. Medicines are sometimes prescribed for purposes other than those listed in a Medication Guide. You can ask your healthcare provider for information about DOTAREM that is written for health professionals. What are the ingredients in DOTAREM? For more information, go to www.guerbet-us.com or call 1-877-729-6679.